Nothing prepares you for the first sight of the Boticcelli’s paintings at the Uffizzi, in Florence. You grew up with these images. They’re on posters, beach towels, coffee mugs, books on Art, mouse mats, the Internet. The first thing you notice, before you’re close enough to see the details, is their greenish tinge. The digital age seems to have a problem with tinges and patinas: It wants them ‘corrected’. Deprived of its subtle shades, white becomes ‘pure white’. Search Google Images for Botticelli’s Spring, for instance. You’ll instantly know what I mean. Like everyone else, I stood in awe in front of Boticcelli's paintings – a mix of appreciation, love and stupor – but where I met the painter was at Siena, a once rival city of Florence, better known for its frantic horse races than for its magnificent cathedral. 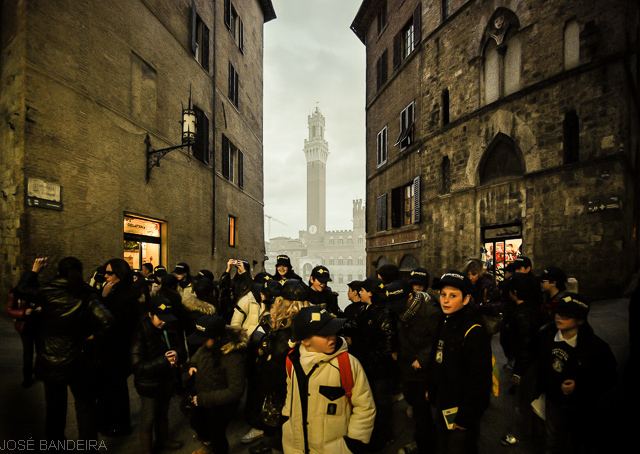 I was watching a group of children on a tour and decided to take a shot of them framed on with the Torre del Mangia, dimmed by the fog, in the background. I looked through the viewfinder and was instantly attracted to the face of a boy on the right. He was looking straight at me as if I was a mirror. If you don’t know Botticcelli’s Adoration of the Magi, please look for it on Google Images (or on whatever search engine suits you). The figure looking at you on the right is – as far as we know – Sandro Botticelli himself. I guess you have to be in some state of bliss to have visions like these, and I certainly was - for I was happy, then.